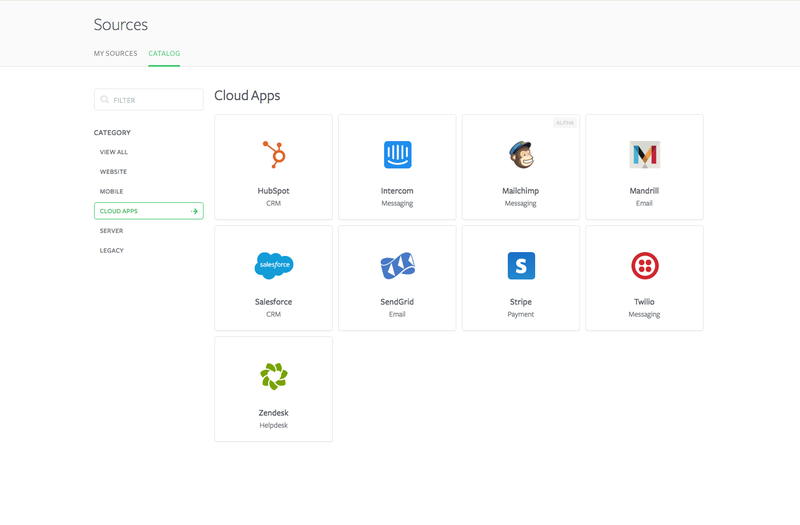 Segment helps developers manage all the analytics data their apps and services generate. Besides fanning out this information to analytics services like Google Analytics and Mixpanel, or marketing tools like Marketo, all this data lands in a data warehouse. At best, though, all this information only shows an incomplete view of a customer’s journey from landing page to purchase. Starting today, Segment users will also be able to combine their internally generated data with data from third-party tools like Salesforce, Zendesk, Stripe, Twilio and others — data that is typically siloed and hard to integrate (support for Google AdWords, Facebook Ads and other tools is coming soon). With this new tool, called Sources, developers will be able to create tools and dashboards that show a far more complete story of how users interact with a company. Say you want to know how your SendGrid campaign converted. You can now combine data from your email campaign with analytics data from your apps and Stripe to see how well they performed (using the customer’s email address as the identifier). As Segment co-founder and CEO Peter Reinhardt told me, users simply must use a standard OAuth workflow to add these new sources to their existing Segment accounts. The company slightly modified the pricing structure for its warehouse plans to include support for up to three additional data sources for a fixed fee. He also noted that while most users will probably combine this data with an existing business intelligence service to build dashboards, the company itself has no plans to add any of these services itself.